The Southwest Playground Project (SWPP) received support from ANC 6D at this month’s meeting for the Urban Forestry Administration to work on pruning and removing unhealthy/dead trees from the site of the new playground proposed for the park next door to the Southwest library at 3rd and I streets. The ANC also commented favorably on LAB Architects’ design of the playground, which has changed and will now take up less space on the site. Play equipment will be placed on the central berm with a rubber play surface installed beneath for safety purposes. GameTime play equipment will have a nature theme, which will include a butterfly net for climbing; a log crawl thru; stepping stones in the shape of mushrooms; and spinning leaf seats. There will also be a swing set with an ADA-compliant swing included in the design. Most of the equipment is suitable for children ages 2-12, except for the butterfly net, which is recommended for children aged 5-12. 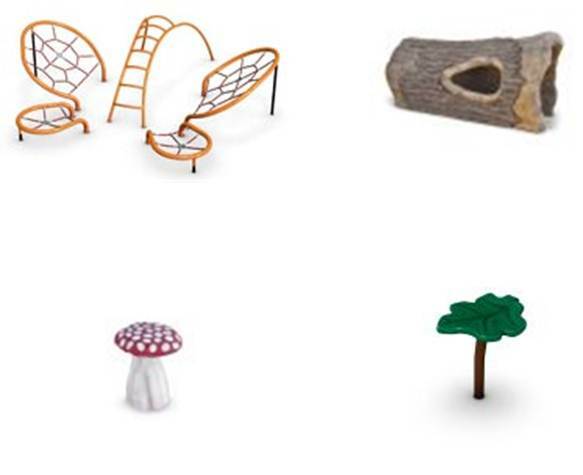 Some of the proposed play equipment. Ornamental fencing will be installed along I Street and at the corners where 3rd Street and Wesley Place both meet I Street to keep children from running onto the street. 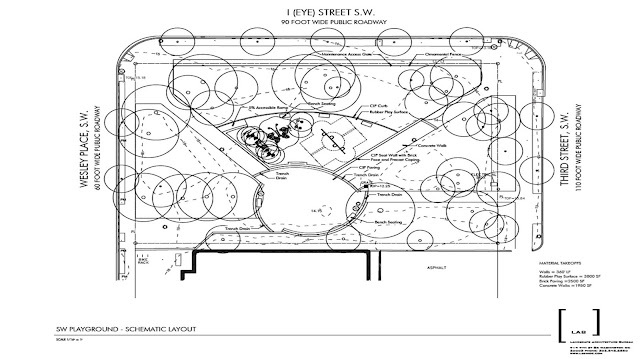 The fencing will be the same that DPR uses at its other playgrounds and will be 18" tall. Seat walls will be placed on the south side of the play area to further enclose the space and provide seating for parents and children alike. Benches will also be placed in the play area. Trench drains will allow water to naturally drain below and should reduce the risk of mosquitoes. A less impervious surface will be used at the base of the park adjacent to the library which should also help with drainage. Site of SW Library park. Once the final designs are complete, the project will undergo the bid and contract award process, followed by permitting. At this pace, the project should be complete before the end of the year, if not sooner. The SWPP is affiliated with the Near SE/SW Community Benefits Coordinating Council, a local non-profit.